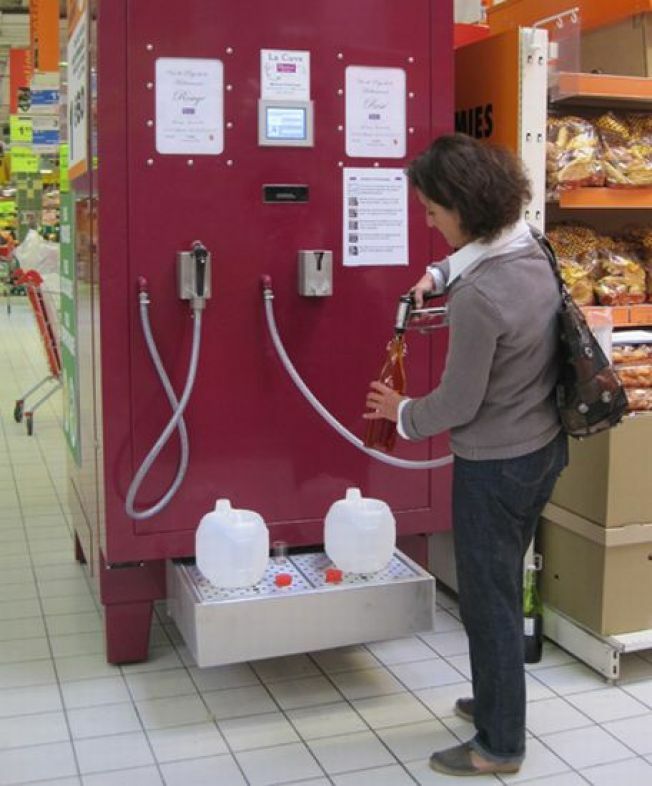 In a move likely to get up the noses of the nation's wine snobs, a French company wants to install huge self-service wine pumps in US supermarkets. You simply bring your own jerry can or rinsed out gallon milk jug, select red, white, or rose, and then pump away. Once you're done, the machine prints out a label with the price for the checkout cashier. The machine's developer, La Cuve Réserves Précieuses, has already installed several of the pumps in French supermarkets, and plans to expand into the US next year. The French machines sell their wines for about $2 a Liter, which works out to around $1.50 for a typical wine bottle's worth. That makes it cheaper than even a low-cost boxed wine. In addition to providing a cheap source for wine, the treehugging crowd is likely to appreciate this system's efficient bulk distribution and container recycling, which promises to eliminate piles of discarded glass bottles. I just hope we don't end up with winos going into supermarkets, sticking the nozzle into their mouths, and pushing start button.